Change, more often than not, is driven by circumstances rather than scholastic deliberation. As President Obama once put it, perhaps as an unintended barb to the legions of geo-political seers that stalk Massachusetts Avenue, Washington DC, “Change doesn’t come from Washington but comes to Washington.” So it was with Prime Minister Modi’s three-day state visit to the USA (6th June to 8th June 2016). Not only did the visit lay the foundation to several strategic goals mutual to both sides, but was also punctuated by symbolism that provides a basis for the future. 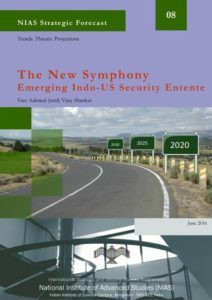 When Modi suggested stepping out of the “shadows of hesitations of the past” he could not have stated in more unequivocal terms that India’s strategic orientation was now one that not only respected the status quo, but also would contribute towards ensuring that attempts to upset it would not go unchallenged. At the same time laying a floral wreath at Arlington Cemetery to the Tomb of the Unknowns (a first for an Indian PM), on the face of it, was a tribute to that one unquestioning instrument of state power who historically has laid down his all for a national cause. Underlying the salute was recognition of the role played by the military in binding and stabilizing an uncertain security milieu. Two salients of his visit are particularly significant. Seemingly disparate, they share a geo-political outcome that aggregates to stability in world order. The first is measures to bring about strategic equilibrium in the Indo-Pacific and the second, India’s admission into the Nuclear Suppliers Group (NSG) as a step in support of stability in global nuclear politics and commerce.